I attended Bridgetown Regional High School in the Annapolis Valley. After that, I attended COGS in Lawrencetown for a year and received my Survey Technician Diploma. I enjoy working outside and for that reason Surveying appealed to me very much. That summer I was hired by the Canadian Federal government to help work on a team that was implementing a Differential GPS base station network along the Canada - US border from Ontario to New Brunswick. I returned to COGS in the fall and completed a second year, receiving my Survey Technologist Diploma. That summer I once again continued working for the Federal Government. This time the team was implementing a Differential GPS base station network in Western Canada and I got to survey my way from Ottawa west to BC. Upon project completion I was fortunate to receive a position at the Land Information Center in Lawrencetown. This was also very interesting for me as it involved a lot of drafting and working with updating the property mapping of Annapolis County which I enjoyed. 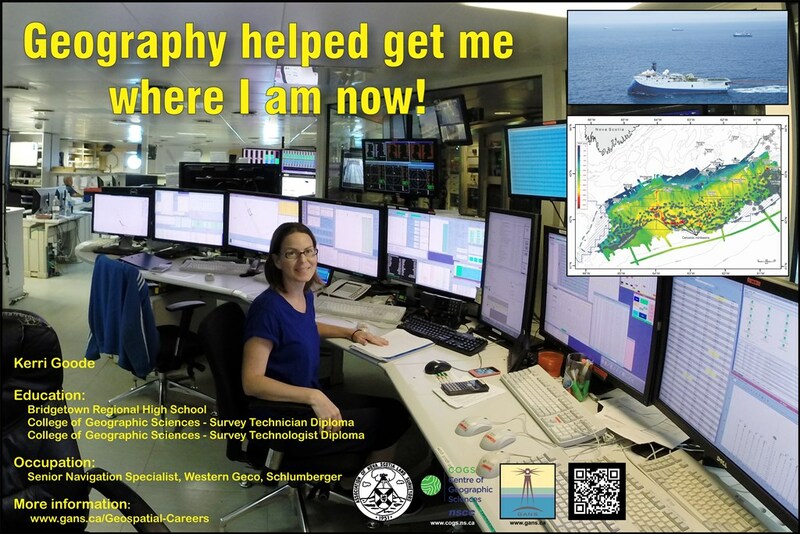 I do love to travel though, so when an opportunity came up for me to apply at a company called Western Atlas doing marine seismic surveys I took a chance and applied. That was in 1996 and I have been in the offshore industry ever since. I am now a Senior Navigation Specialist with Western Geco, a segment of Schlumberger, which is the largest oilfield service provider in the world. As a Senior Navigator with Western Geco, I have the chance to work in a lot of different locations worldwide with a global team of colleagues. We generally work on rotations of 5 weeks onboard a vessel and 5 weeks off. It is common to be assigned to the same vessel for periods of time, but the vessel will be assigned to different locations. There is usually a crew of about 60 people and it is a 24 hour operation onboard. This diverse workforce allows for a very interesting work place, with sometimes over 30 different nationalities onboard. As for the work, I am usually assigned to what we call the master streamer vessel, in a multi vessel fleet. I am daily overseeing the positioning of the fleet and the in sea equipment. We have a variety of survey types that we can do, which ultimately will result in an image of the subsurface reservoir. The resolution of this is dependent on the type of survey performed. Seismic surveying can be the first step in exploration of an area, it can be a high resolution imaging project for areas of interest, and it can be monitoring the output of known reservoirs over time. As technology advances we are performing more and more complicated surveys in deeper waters and I have been lucky to be involved with these complex multi-vessel projects more and more over the past years. The navigation department is vital to ensuring that the fleet is in the right place at the right time. I have been lucky to work in more than 20 countries over my career and the list continues to grow. I have experienced many things that only this kind of career could provide. A recent project that I really enjoyed was one in my own back yard. I was lucky to participate in the Shell Canada Shelburne WAZ project in 2013 followed by BP Canada Tangier WATS in 2014, both conducted offshore Nova Scotia.